FOOTBALL: How You Doin? We Chime in on the Penn State Football Coach Search. How You Doin? We Chime in on the Penn State Football Coach Search. I think that we can all agree that Penn State's coaching search has gone on longer than the 100 years war Rip Van Winkle's beard we had hoped. I wish I could say that I was surprised that PSU hasn't named/hired/interviewed a coach - but the longer this drags on, the more "typical" it seems to me. In discussing this amongst ourselves, we've determined that, in addition to many other things, PSU has the opportunity to fill a void that has been glaringly present over the years… Penn State can hire a cutie. Now, we're not saying that Coach Paterno wasn't a handsome man (we're not?) or a dapper dresser - in fact, thanks to his unique game day garb, I learned the meaning of the word "garb" at a very young age - but I would use just about every word in the dictionary before I would describe Coach Paterno as superficial - so he just doesn't qualify for these evaluations. If the greatest coach in the history of College Football must be replaced, then why shouldn't we do so with the cutest? Until Penn State (AD Joyner) ends this particular stage of ridiculousness and hires someone - we're happy to jump on the ludicrous bandwagon and post some of our choices in the cuitepie category. 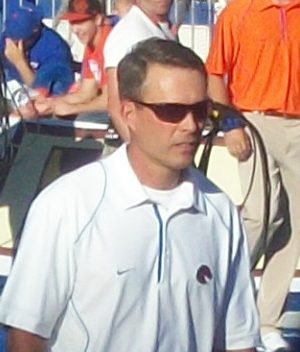 My personal favorite/front runner for the job is Chris Petersen of Boise State (sorry Alfred). Petersen is an exciting prospect on the football side of things, enjoying years of wins with the Broncos. He's got a certain Joeness in that he's currently at a program that just keeps winning, but doesn't get national recognition - even though they've been on the scene for years - and BSU is second only to PSU in the BCS in academics and graduation rates. Also, Coach Petersen is already used to the color blue and BSU sounds a lot like PSU - and, his name even starts with a P.
Petersen is a California native, and played quarterback at UC Davis; I have to admit, I'm not uber impressed by his academic credentials - but his obvious love for our nation's landmarks shows the type of loyalty we expect and gumption to boot. He did spend a year at pitt as qb coach - which is unfortunate - but rehabilitatable. He is, reportedly, an outdoorsman and an avid fisher - sure State College is landlocked - but we've got outdoors and Black Moshannon is just 30 minutes away. I have used my super sleuth skills and determined, by analyzing the spelling of his last name, that he is of Scandinavian descent - specifically Danish (or Norwegian). As a Swede, I'm willing to look past this particular defect, mostly because he's just so darn good looking. Petersen, who is married and has 2 sons, has, reportedly, stated that he's "not interested" in the Penn State job - if you're saying this to get our attention (more $$$? ), then you've got it - if you really don't love us want the job, then expect years and years of bitterness - I kid, we heart you!!! until we don't.